Turf grass will not grow well in high acid soils, and most soils in Connecticut are acidic by nature. Acid soils are commonly referred to as sour. Acid soils are not necessarily infertile but an indication that the amount of calcium and magnesium is low and needs to be adjusted. Most importantly low PH levels may cause fertilizer to be unavailable to the grass plant. The greater the acidities of the soil the more significant need for lime. Most lawns prefer a PH between 6.5 + 7.0. 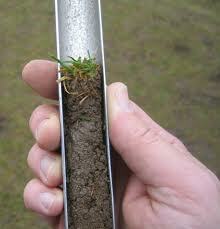 A lawn soil test will determine the exact amount needed and the number of applications required. Applications of lime to correct PH can be made any time of the year.